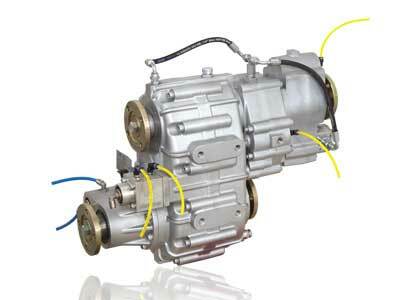 UARA.306 is the most featured Transfer Case among 300 Series with 4x4 drive feature, differential lock and PTO output. When the differential lock is activated, front and rear differential are getting equal torque. In case of the differential lock is deactivated; torque is transmitted to the differentials as needed. It can provide 100% of input speed during 4x2 drive. This Transfer Case makes the truck double speed as high gear and low gear. UARA.306 has designed for shunting locomotive, rail line maintenance vehicle, Light Duty Fire Fighting Truck and any application which needs Four-Wheel Drive. This transfercase also has the ability to accelerate when drive at reverse gear. Thanks to this gearbox, if the operator activates the reverse of the transfer case, it can go back at the speed that it advances forward. In addition to all these, the UARA.306 also has a PTO output to make run superstructure. The PTO output can be designed as flanges in all ISO standards or directly coupled to hydraulic pumps. The Transfer Case built on with lubrication system and preferably can be designed with cooling system. Cooling system can be heat exchanger or cooling fan. Engage/Disengage sensor can be installed on PTO output and main drive.